Download the PDF version (590 KB) of this content. Western Canada's agriculture industry will see a marginal increase in output in 2018, with crops and livestock receipts expected to grow by only around 1.0%. The long-term trend of declining employment in the industry is likely to continue over the coming years, falling by -1.0% in 2017 and -6.0% in 2016. Increased farm exports continues to be the bright spot in the region's agriculture picture. With domestic consumption of agricultural goods expected to increase only moderately as the population grows, exports will provide the most significant opportunity for future growth. However, international trade concerns will present challenges moving forward; while in parallel governments have been investing in growing and diversifying agriculture production and exports. All four western provinces have active and diverse agricultural industries. Saskatchewan, Alberta, and Manitoba produce significant grain and oilseed crops, while British Columbia (B.C.) accounts for the vast majority of fruit produced in Western Canada, as well as significant vegetable production. Western Canada's animal production is also considerable. Alberta has the largest provincial share of cattle ranches and farms in the country, while Manitoba has the third most hog operations. B.C. has the second largest number of poultry and egg producers, as well as the highest number of aquaculture producers. In 2017, farm receipts from the western provinces increased 3.1% to $37.9 billion, which accounted for more than 60% of the national total. Crop production in Western Canada accounted for $23.7 billion in 2017, up 1.6% year-over-year. However, Western Canada's wheat production totalled about 27.3 million metric tonnes in 2017, down 5.9% from the previous year. Production of canola increased by 8.7%. Supply-managed sectors have a strong presence across the four western provinces. According to the 2016 Census of Agriculture, there were 1,308 dairy cattle and milk producing farms in the four western provinces, representing 12.4% of Canada's overall dairy cattle and milk farms.16 Meanwhile, the number of poultry and egg producing farms in western provinces increased from 1,906 in 2011 to 1,953 in 2016. Nearly 40% of Canada's poultry and egg producing farms were located in the four western provinces in 2016. Under the recent NAFTA talks, the U.S. has put the Canadian supply-management system on the table for renegotiation, creating some anxiety for farmers in Western Canada. Agricultural employment is expected to stagnate in the Western Provinces over the short-term. 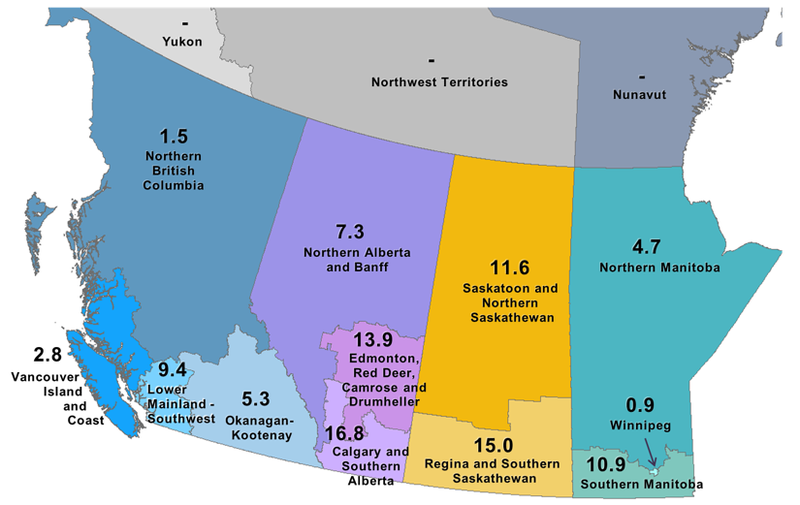 Alberta is the only province expected to experience gains. Losses are anticipated in Manitoba and slight setbacks are projected in Saskatchewan and British Columbia. 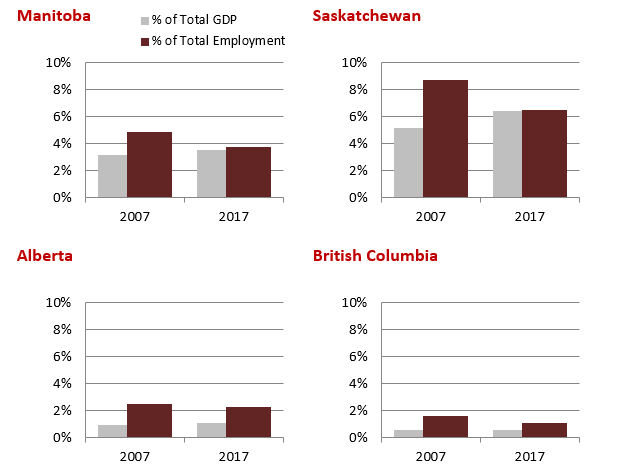 Large agricultural regions such as Calgary & Southern Alberta, Regina & Southern Saskatchewan, or Edmonton, Red Deer, Camrose, & Drumheller are expected to see very little variation in their agricultural employment levels over the next three years.